Sorry Wet Cat is no longer sailing/ not running trips. Wet cat has now been replaced with a brand new boat! 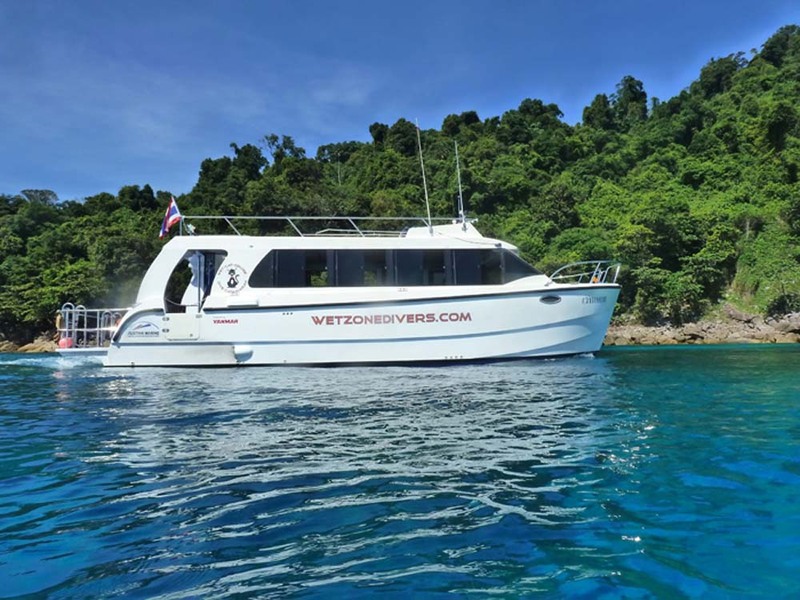 Wet Cat is a fiberglass twin-hull speed catamaran that offers well-organised, fun & safe day trips to the Thailand’s best dive sites. 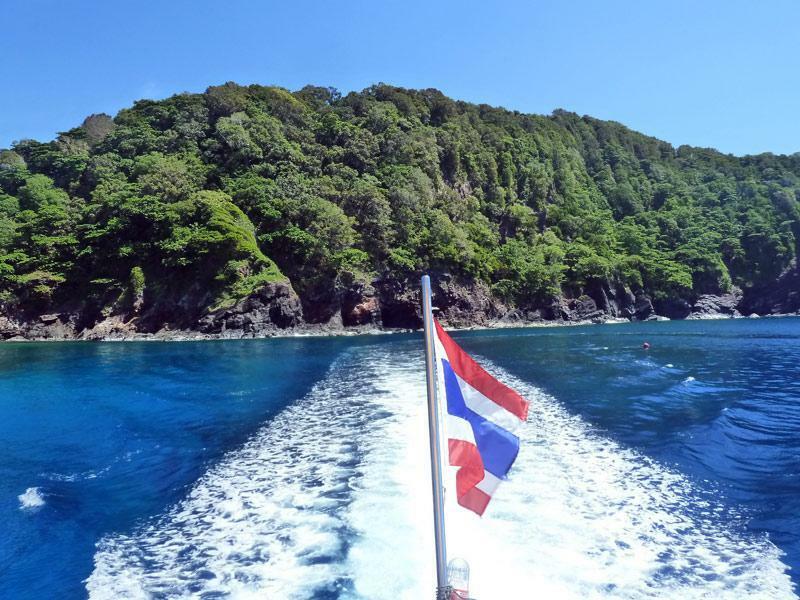 The boat is operated by a very well-respected German-owned dive centre and sails to Koh Bon, Koh Tachai & the world-famous Richelieu Rock. 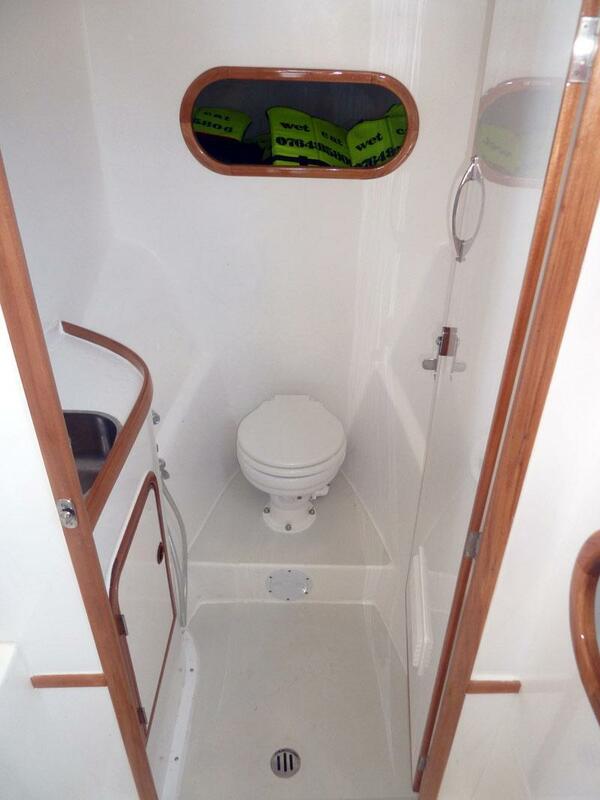 Unlike speedboats, the twin-hull design means that trips are more comfortable, and sometimes faster. 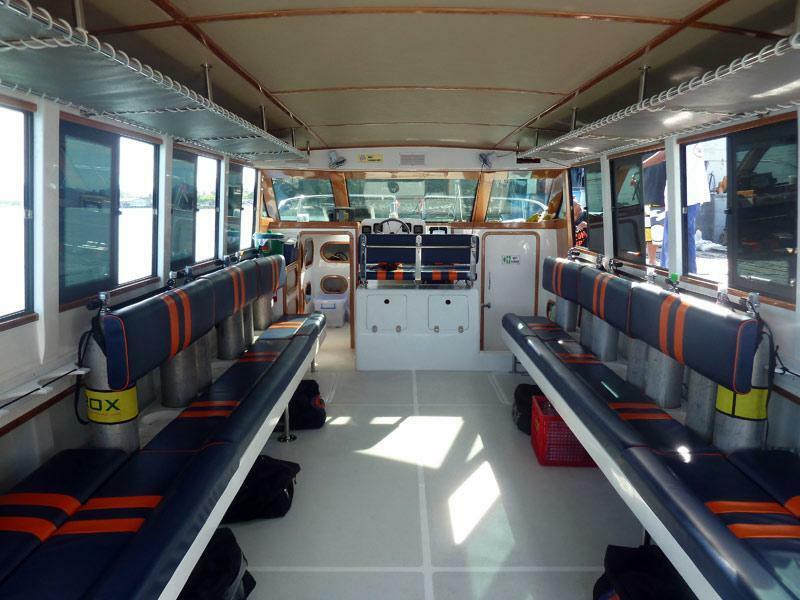 From its first launch in 2012 the boat was already arguably the best day trip diving boat in Thailand, and then in the summer of 2014 Wet Cat underwent modifications including a larger dive platform thanks to new inboard engines. Trips are now faster and smoother, and getting off and back on is now even easier. 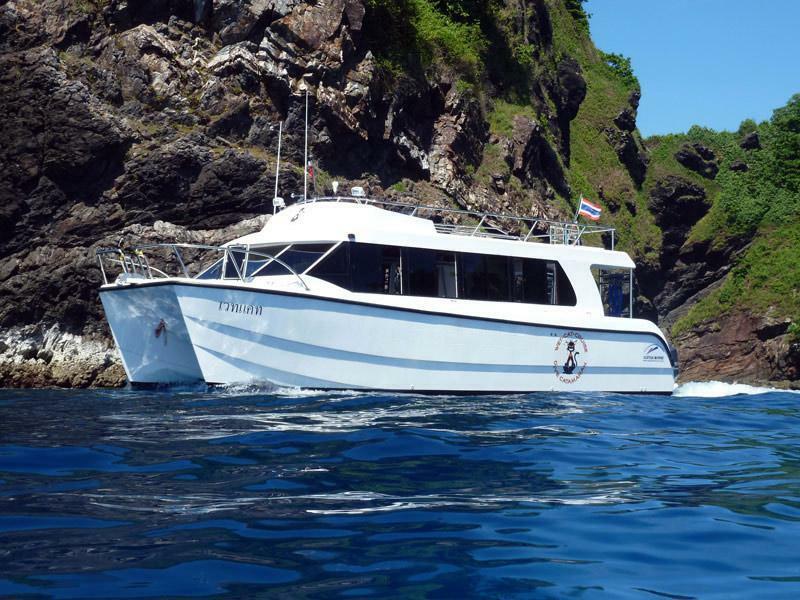 The team ensures well-organised diving day trips to Richelieu Rock, Koh Bon, & Koh Tachai, with small groups of divers and professional guides. 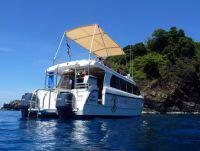 At lunchtime, guests can snorkel around the boat, relax on the roof or in the shade. A delicious lunch, fruits, snacks & soft drinks are included in the price. Nitrox fills are available for the lowest rates, and everyone on board is guaranteed a great service and lots of safe & enjoyable diving. Wet Cat's weekly schedule is designed to give a variation of the three best dive spots in Thailand. 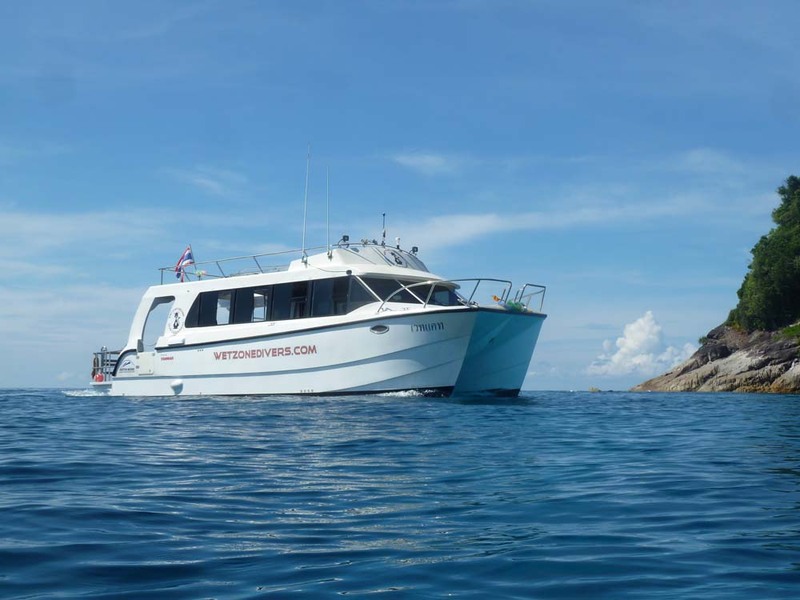 Therefore, it's common for divers to join more than one Wet Cat trip, but they still enjoy the comfort of their Khao Lak hotel and don't need to sleep on a diving liveaboard. Diving from Wet Cat involves safe, fast, smooth & reliable trips. And with German ownership and management, everything runs like clockwork. Starting in the south of Khao Lak at 7.15am, guests are collected driven to Baan Nam Kem Pier, which is to the north. 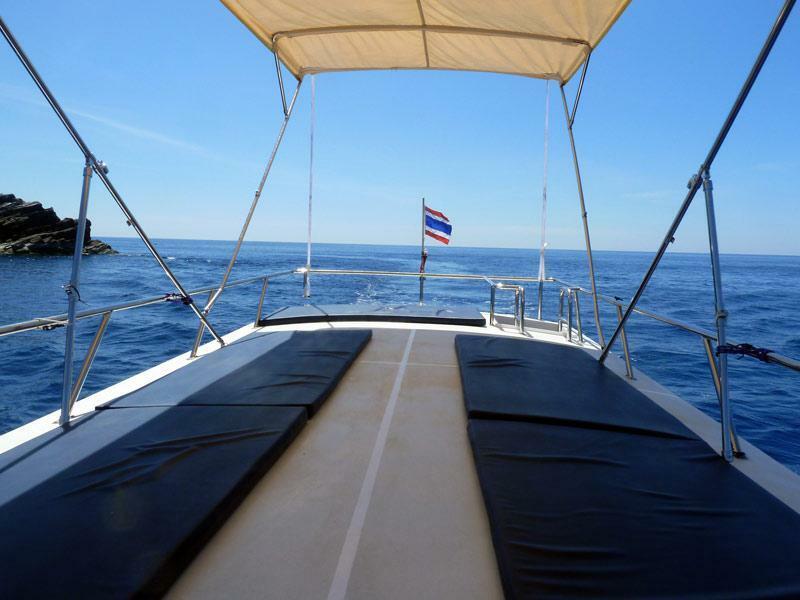 At 8.30am the boat departs and sails quickly and smoothly out to the dive sites. Dives are at 10.00am and 12.45pm. Wet Cat returns to the pier at around 3.15pm. Most divers are back at their hotels or resorts by 4.00pm. 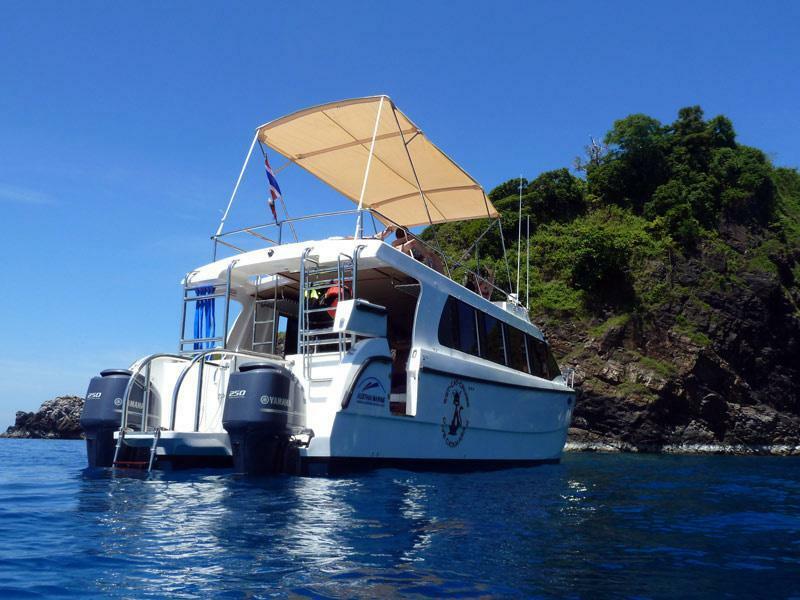 Please note that due to the professionalism of the team, they require guests to ‘check in’ at the dive center in Khao Lak before 6pm on the day before the (first) trip. This enables the management time to complete paperwork and equipment fitting and checking. Everything should be taken care of the evening before in order to make the diving day run as smoothly as possible to benefit everyone. Material: GFP. ( Glass Fiber Reinforced Plastic ). Engines: Inboard Diesel, 640hp. Max Speed 30 Knots. 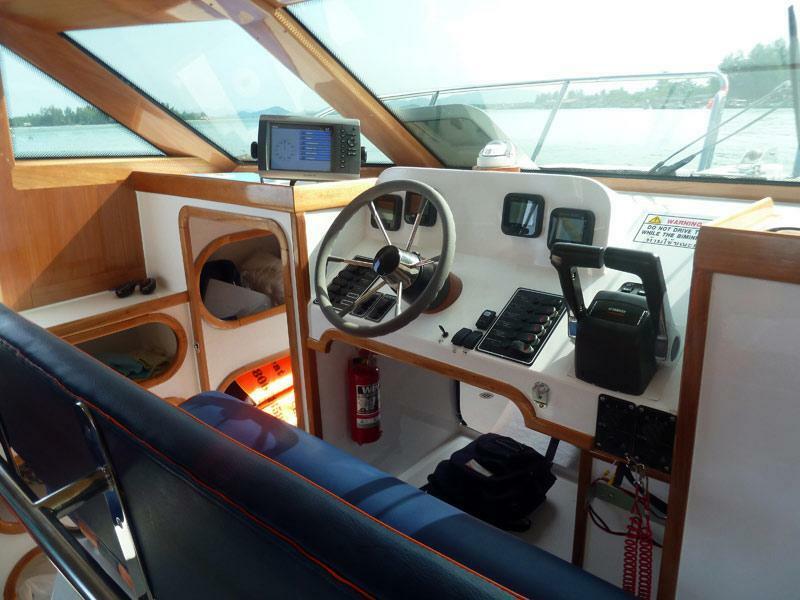 Navigation: GPS, Compass, Depth Sounder, Radar And Navitext. If you would like to take part in any kind of PADI diving course as part of your trips on Wet Cat, please let us know. There are all kinds of courses to choose from, including learning to dive and increasing your diving skills and experience. You can even take part in a PADI Discover Scuba Diving 'intro dive' - although this is not possible at Richelieu Rock, due to the sea conditions and the shallowest depth of the reef. 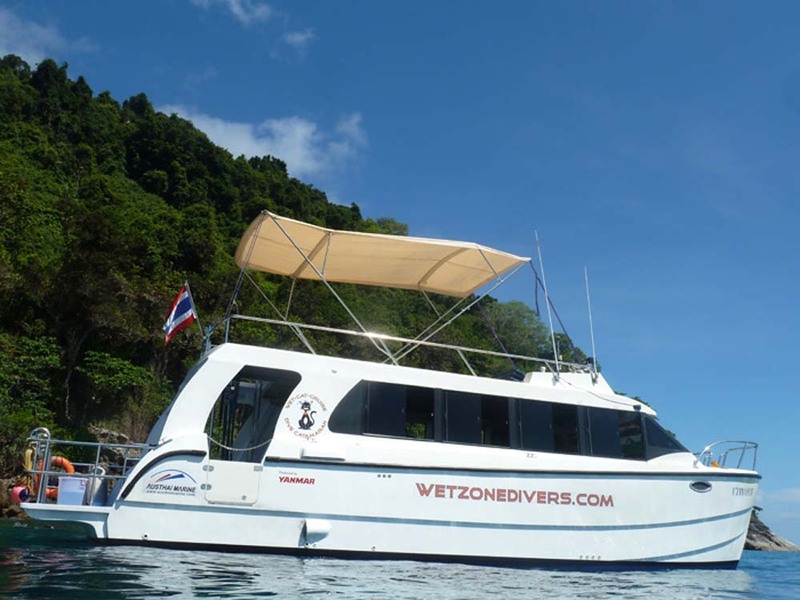 To ensure the most well-organised trips, Wet Cat guests are requested to 'check in' at the dive centre in central Khao Lak at any time before 6pm the day before your first day trip. This enables us to process paperwork, fit equipment and confirm the time and place for the morning pick up. On the diving day guests are collected from hotels and resorts in the morning and taken directly to Baan Nam Khem Pier to board Wet Cat. Delays and problems are unfair for the other guests on the trip. 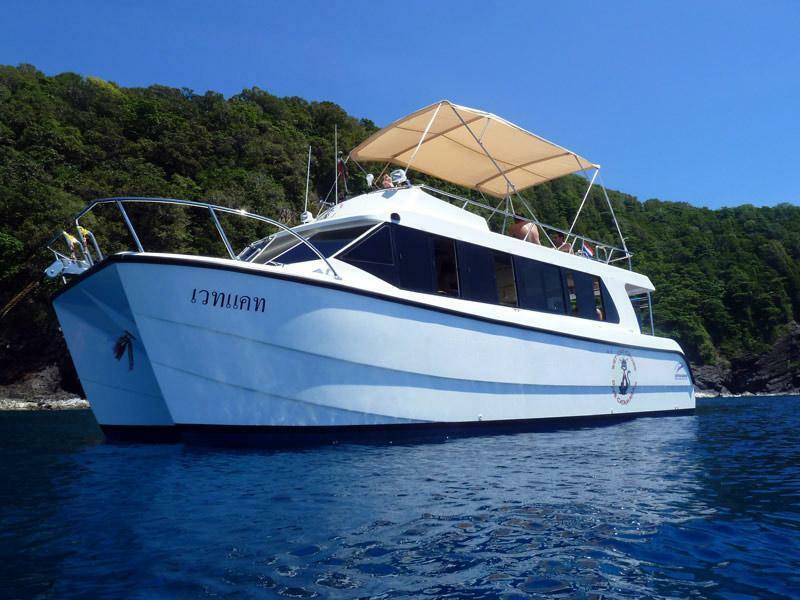 Prices are 'per diver' and include local pickup, lunch, fruits, snacks, soft drinks, Divemaster guide services, weights & 12 litre (air) tanks. National park fees (700 THB / diver & 500 THB / non-diver) are payable in local currency. Equipment rental (if required) is 500 THB. Nitrox (for certified divers) is 100 THB / tank, and please inform us in advance if you would like to use it. Divers who wish to use Nitrox should inform us or the dive centre as soon as possible in order to prepare the tanks.